Via Brasil Steakhouse is now taking reservations for the Annual Thanksgiving Day Feast on Thursday, Nov. 24, 2016. 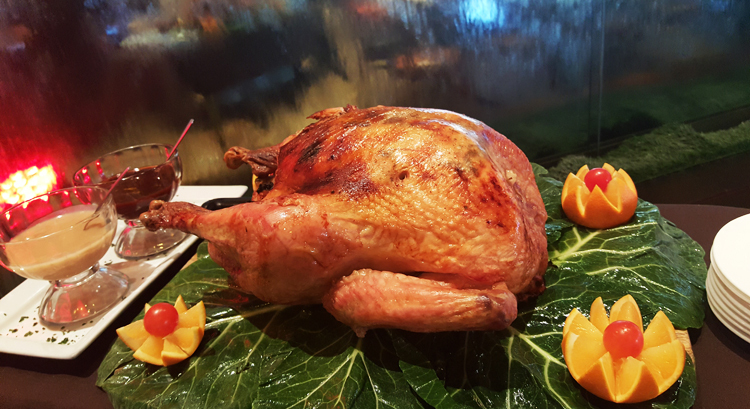 We will be serving Lunch and Dinner and both will feature Traditional Whole Roasted Turkeys Carved Tableside. The Gourmet Salad Bar will be set with traditional Thanksgiving Fixens and guests can expect there will be a constant parade of meats. Lunch service starts at 11am and will feature both Prime and Sterling Menus with prices starting at 42.99 per person for the prime menu of 14 meats, Gourmet Salad Bar, Sides and Thanksgiving Turkey. Lunch will also offer our Sterling Menu with our full compliment of 21 meats. 3pm will mark the start of our Thanksgiving Dinner service and feature the Full Sterling Dinner Menu Only. Menu will include 21 meats, along with Roast Turkey carved tableside, Gourmet Salad Bar and Side Dishes for 51.99 per person. 2016 marks the 8th year Via Brasil will be featuring this unique Feast and every year gets bigger and better. Don't miss out. Make your reservations today. Sorry, an error has occured with your message. Your Reservation has been sent successfully. Sorry, an error has occured while booking your reservation. If this persists please contact us at 702-804-1400. Local, Authentic and Fresh. Via Brasil Steakhouse offers the Largest Variety, The Freshest Ingredients, and Personalized, Attentive Service. A Truly unique Dining Experience with an emphasis on Traditional Brazilian Cuisine, but also a wide array of multi-cultural dishes. The way an Authentic Churrascaria should be.